Dr Gérald Franchi is registered with the Paris section of the French Ordre des Médecins (the professional body responsible for accrediting and regulating medical practitioners in France) and is one of the few plastic surgeons accredited by the Haute Autorité de Santé (French National Authority for Health). Gérald Franchi is licensed to perform all cosmetic surgical and non-surgical procedures (body and face). Gérald Franchi is a former specialist registrar at Hôpitaux de Paris, former physician and senior registrar at the Medical School of Paris, former surgeon at Hôpital Foch and currently consultant at Hôpitaux de Paris. Do you need to know more before taking your decision? 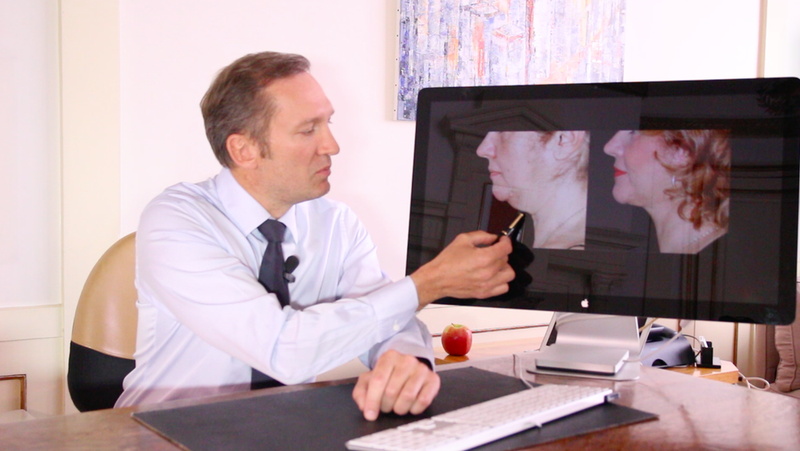 Discover the information pages on the different cosmetic procedures performed by Dr Gérald Franchi. Please, remember that only a consultation with a plastic surgeon can give you personalized information. It is possible to fill in facial wrinkles, creases and lines, or to increase the volume of lips and cheeks with a simple injection of hyaluronic acid or botox. The skin texture can be improved by lipofilling (fat injections) or microneedling. Sagging face skin can be tightened by lift surgery. A double chin can be eliminated by neck micro-liposuction. To bring back the harmony of your face, surgery can be a solution for remodelling the nose, correcting prominent ears, sagging eyelids or dark circles under the eyes, or in the case of face feminization. To improve hair density, hair micro-grafts give definitive results. Several techniques are available to improve breast size and shape. Breast augmentation can be obtained by inserting implants without visible scars and by injection of fat harvested from parts of the body where there is surplus fat (lipofilling). The association of these two techniques (implants and fat injections) is called a combination procedure. Breast lift surgery allows raising and firming sagging breasts, thus improving and rejuvenating the appearance. To correct a breast asymmetry or to reduce heavy (in women) or unattractive breasts (in men) in the case of gynecomastia, plastic surgery may be required. Most patients say that their self-esteem improved after this procedure. When you cannot manage to get rid of the excess fat that resists to dieting and sport, the techniques of liposuction, liposculpture or Brazilian lift allow improving the silhouette (hips, tummy, bottom, flabby thighs). Love handles in men also can be treated by liposuction. After a pregnancy or a drastic weight loss, abdominoplasty (tummy surgery or tummy tuck) allows tightening a sagging tummy that lost its tonicity and to obtain a more harmonious silhouette. Lifting is a technique that can efficiently correct skin sagging in the thighs or arms. Some techniques performed by Gérald Franchi associate recent advances in biostimulation (platelet-rich plasma, stem cells) and surgery. These natural procedures are now essential because they accelerate wound healing, reduce inflammation, improve the skin quality and slow down the appearance of new wrinkles. The aim of reconstructive surgery is to restore the shape and function of a face or body deformed by an accident, a congenital malformation, a tumour or a severe infection.